Our publications provide you with essential guidance on various Alternative Dispute Resolution (ADR) processes in Asia Pacific. Welcome to the second edition of our ADR in Asia Pacific Guide, focusing on alternative dispute resolution (ADR) in Singapore. Over the years Singapore has become one of the leading ADR centres in the Asia Pacific region. The last decade has seen Singapore grow in leaps and bounds as a preferred forum for international arbitration and the city state has recently renewed its focus on non-adversarial ADR processes, in particular mediation. We summarise the development of ADR processes in Singapore and its future direction. 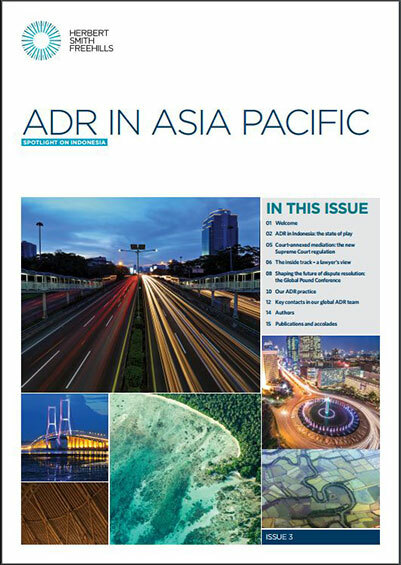 Welcome to the first edition of our ADR in Asia Pacific guide. This publication provides you with essential practical guidance on various Alternative Dispute Resolution (ADR) processes. We report on regional developments and industry trends, drawing on the expertise of our award-winning ADR practice.